Our journey begins, as many of them do, by tanking up at Mister Donut and planning our trip route. Since we’re taking the Tokaido Main line train to Yokohama from Tokyo Station, the Keiyo line train from Etchujima Station will be the most direct route to Tokyo Station and the rest of the JR system. So, our journey really begins with a brisk hike to Etchujima station under a blue sky and pleasant temperatures. Once at Tokyo Station, we find the Tokaido Main Line platform, easily enough… but the train on platform 8 is headed in the wrong direction. We scurry over to platform 7 and jump on the Tokaido Main line train bound for Yokohama just a minute before leaving the platform. We have arrived at Yokohama Station, but the game isn’t over yet, now we need the Yokohama subway to Minato Mirai and the Landmark Tower. I’m well acquainted with Minato Mirai but have never ridden the subway and wow I’m impressed, this is a very modern, well designed subway system! We emerge at the Queen’s Mall exit and… look over there… there’s the book store where I bought some books five years ago! There’s the Snoopy store! There’s the escalator leading up to the two story tall inscription by romantic German poet Schiller! Wandering through this mall is like traveling back in time five years to Worldcon 2007. Outside the Queen’s Mall we find the roller coaster sculpture, the Nippon Maru and the entrance to the even more expansive Landmark Mall beneath the Landmark Tower. Its a lovely day, so we should have a gorgeous view of Mt Fuji from the 69th floor of the Landmark Tower. Let’s go! Tickets to the Landmark observation deck cost Y1000 and like so many things in Japan are purchased from a ticket machine. The ride to the 69th floor takes 45 seconds and is so smooth, you really have no idea you’re ascending at such a high rate of speed. The view from the 69th floor is FANTASTIC… but try as we might we can’t see Mt Fuji. There’s a layer of haze on the skyline preventing us from seeing beyond the horizon. 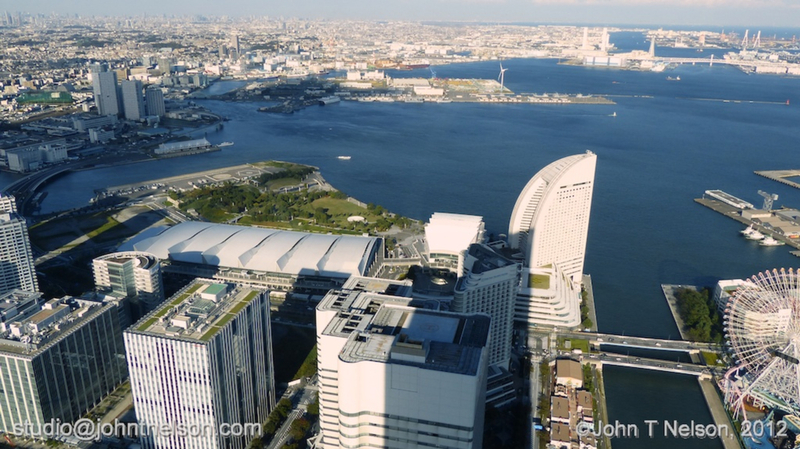 Like the view from Tokyo Tower, the view of Yokohama and Tokyo are awesome, with a cityscape stretching uninterrupted to the horizon. And speaking of Tokyo Tower, not only can we see Tokyo Tower from here, we can see Tokyo Sky Tree as well. We’re both getting hungry so its just a short ride on the subway to Yokohama China Town to explore and find food. Yes, this is China Town alright… chinese gates, bright lights, lots of restaurants and souvenir shops. Yup, we’re in China Town. Our wanderage in Chinatown at an end we decide to skip Yamashita Park for today and have dinner at a nearby Chinese buffet, decent food but small portions and overpriced. We head back to Yokohama subway, ride the JR Rail Tokaido Main Line back to Tokyo Station. At this point I suggest we take the Tokyo Metro back to Monzen Nakacho, all we have to do is walk to the Tozai subway gate. And so we walk… and walk… and walk… and walk. Man, I am sorry I suggested that maneuver, we might as well have walked all the way back to Monzen Nakacho from Tokyo Station on foot for all the good that did us.